There are a multitude of ways of sharpening images, many are versions of simple ‘unsharp masking’, a technique dating back to film days. As computers have become more powerful, it becomes possible to apply increasingly complicated theoretical solutions to software for ‘fixing’ aspects of image sharpness. 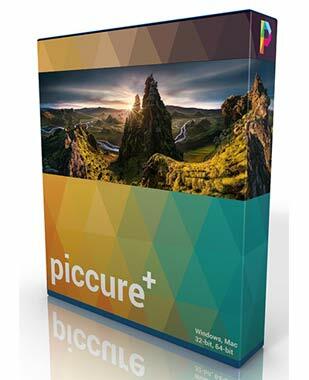 Piccure+ is one such software package that only a few years ago would have taken too much computational power to run in a reasonable time. 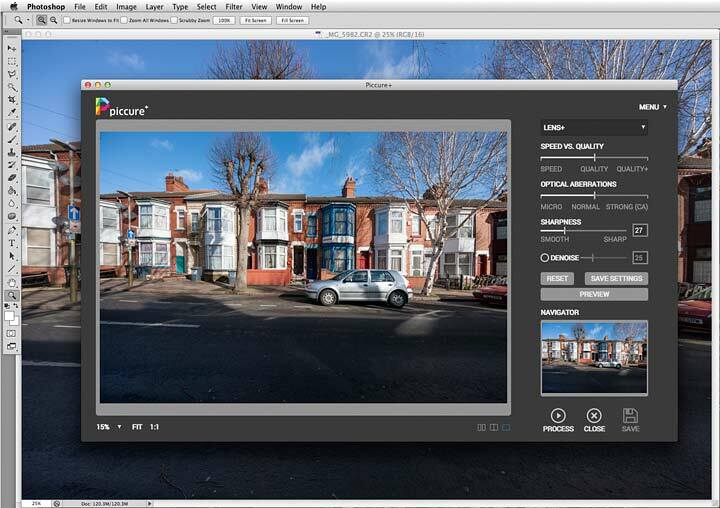 Keith has been looking at Piccure+ as a plugin (in Photoshop CS6), to see what it can do for images. There are two basic problems that can cause softness in an image that Piccure+ can address, one is a blur caused by slight movement of the camera, whilst the other is caused by the limitations of actual lens performance. I’m going to assume that you focused the camera properly, since that’s something that really is your job. Given that camera shake is also something you could avoid too (out comes the tripod) I’ll look at that aspect of the software later, but I’ll just note that Piccure+ is very effective with small amounts of shake. Piccure+ – What do you get? The software installs as a plugin and as a standalone application for Mac and Windows. It does handle RAW files directly, but not with the flexibility of using Lightroom/ACR or, as I also tried, DxO Optics Pro (V10). I’ve found it great tool to consider after RAW processing, however, as I’ll show, to get the very best results, you may need to alter some of your RAW processing options. The software will work on JPEG images, but note that these may well have had quite a bit of processing in the camera and this can seriously reduce the amount of processing that can be applied later (one more reason to shoot RAW). The software was installed from a download, and found the associated applications to work with as a plugin. When using as a plugin in Photoshop, I should note that the results are returned applied to the layer you are working on. There is currently no option to return them as a new layer or smart filter. So, before experimenting in PS, I’d suggest duplicating your image layer – even if just to make comparisons easier. The initial window shows the quite simple interface, in this instance looking at one of the test images I took when writing up my recent review of the new Canon EF11-24 F4L lens. There are few options to set. I’ve set ‘Advanced Lens+’ which gives me the Speed vs. Quality slider. Do take a short while to read the guide (Handbook) since it’s easy to miss a few finer points of the software given the apparent simplicity of the interface. Looking at the image at 100% magnification gives a very clear view of the sharpening, and using something like the side by side before/after display makes it very clear. You can see a small zoom outline in the centre of the whole image ‘Navigator’ display. Note that you do have to press the Preview button to process the image section in the window, to see the effect. This needs repeating if you change settings. The difference between ‘Quality’ and ‘Quality+’ settings is noticeable in the view below, from towards the corner of the image. Using the higher quality (slower) setting results in less edge artefacts (more on these in a bit) and better handling of the finest detail. 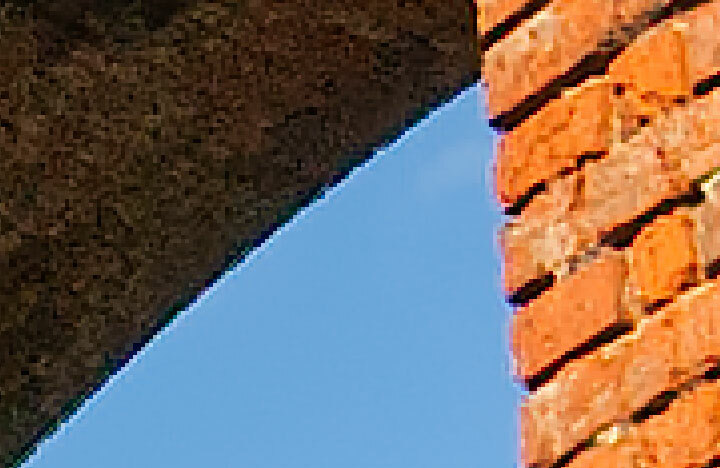 Mouse over the image to see the higher quality setting (zoomed to 400%). In the examples I’ve shown here, the ‘sharpness’ setting is just at the default. It can make quite a difference to the resulting image. 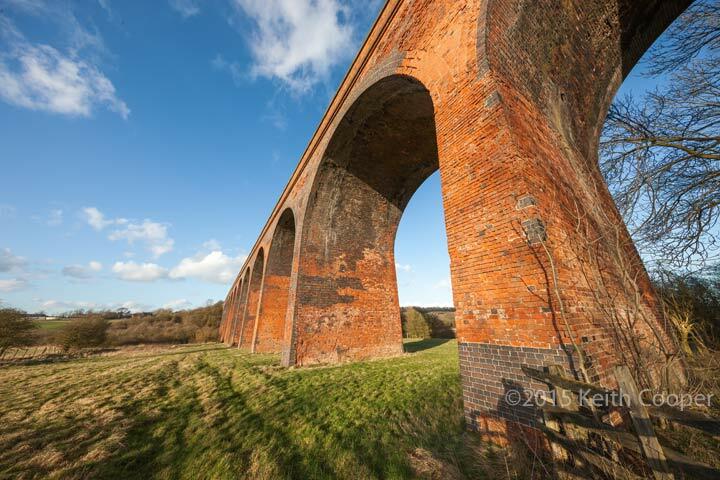 Note though, the influence of sharpening from your RAW conversion, in the views of the viaduct further down the page. Even at low ISO settings, a small amount of noise reduction may benefit your images. Move your mouse over the image to see a small amount applied. Remember that the images above are very highly magnified, so the amount of visible noise in your final image or print may be very low. 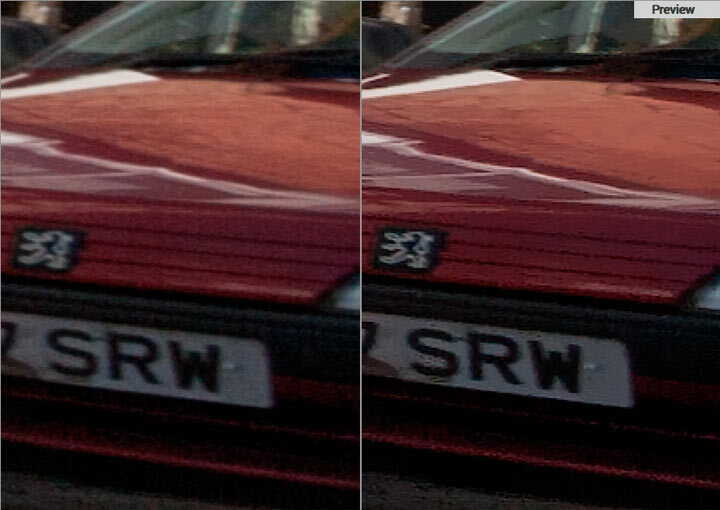 Looking at noise levels, it’s tempting to wonder if a bit of noise reduction during RAW processing might be in order? I’d suggest getting the demo version of the software to try it out, since this will likely vary with software and camera type/settings. 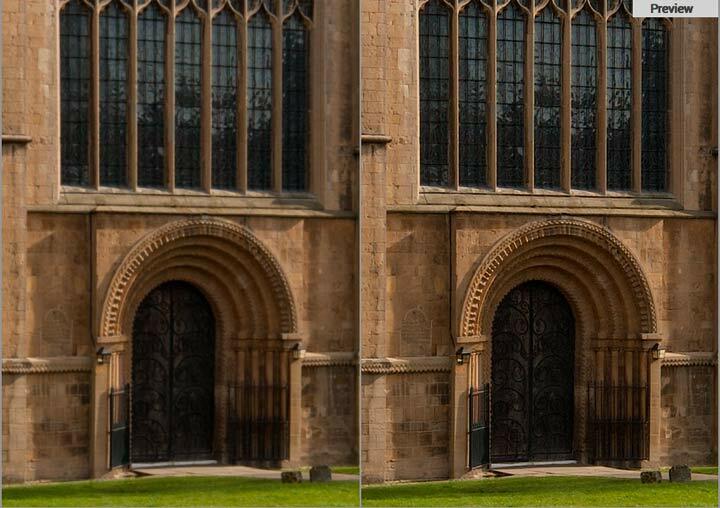 This example shows a 400% detail of an image from a Canon 1Ds3 (21MP) processed in ACR with its normal small amount of sharpening. Move your mouse over it to see a Piccure+ processed version. Now look at this softer version below, with no sharpening at all in the RAW processing settings. Once again, mouse over it to see the Piccure+ sharpened version. Note how the RAW processing sharpening in the version above has led to more obvious sharpening halos, even at a very low setting. You might be wondering why I noticed this seemingly tiny effect? Well, I make large prints and sometimes have to provide extremely large files from my camera files. These edge effects can make a significant difference when upscaling. There is more about my ‘whole workflow’ approach to upscaling, in an article I wrote about making a 3x2m print from an 11MP Canon 1Ds file. If I’m going to be supplying a print or file at a ‘non-standard’ size, I’ll always consider going back to the original camera file. The deconvolution sharpening applied by Piccure+ works very well with all kinds of lenses, and should not be confused with lens profile based geometric correction or chromatic aberration correction. Piccure+ can handle chromatic aberration as well, but you’ll want to experiment as to when it beats applying it during RAW conversion. 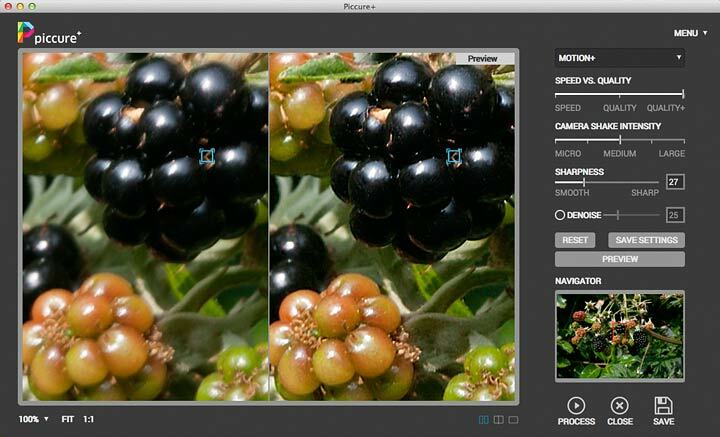 Piccure+ does not rely on lens profiles, or correct geometric distortion of images. If I need that, I’ll address it elsewhere. One lens type that conventional lens profile based solutions can’t handle is the shift lens. 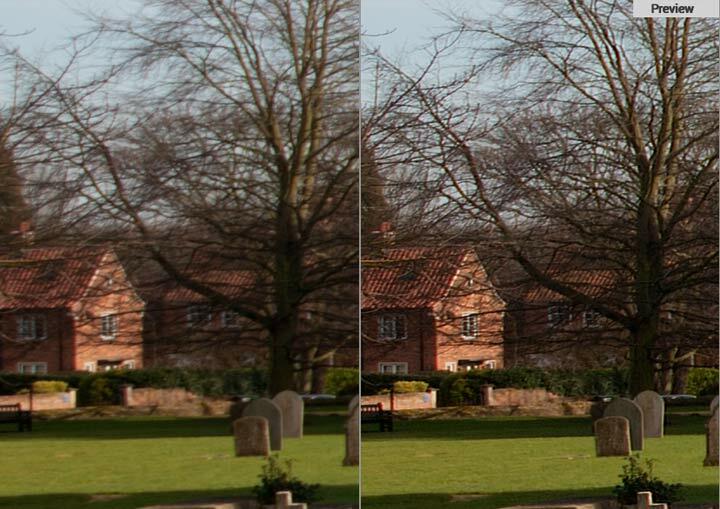 Such lenses do not include any information in the camera EXIF data as to the amount of shift, so software doesn’t know where the true centre of the image is (the centre axis of the shifted lens). Since Piccure is looking at local detail in the image to work out its corrections the lens shift doesn’t affect it. 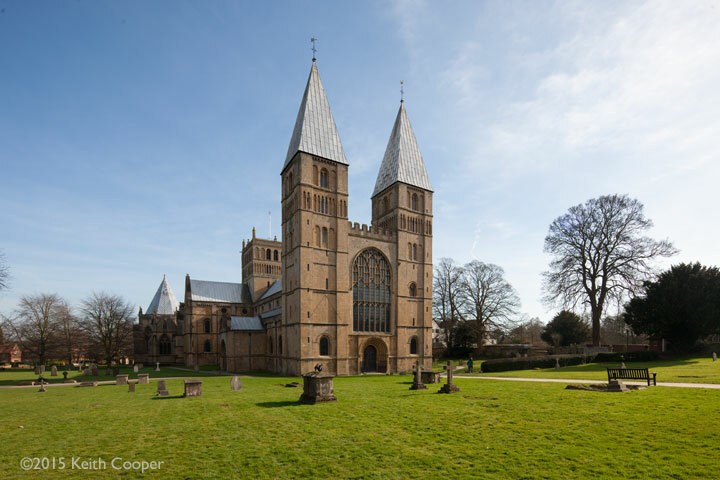 This image of Southwell Minster was taken with the TS-E17mm shift lens – a great lens, that I regularly use for my architectural work. 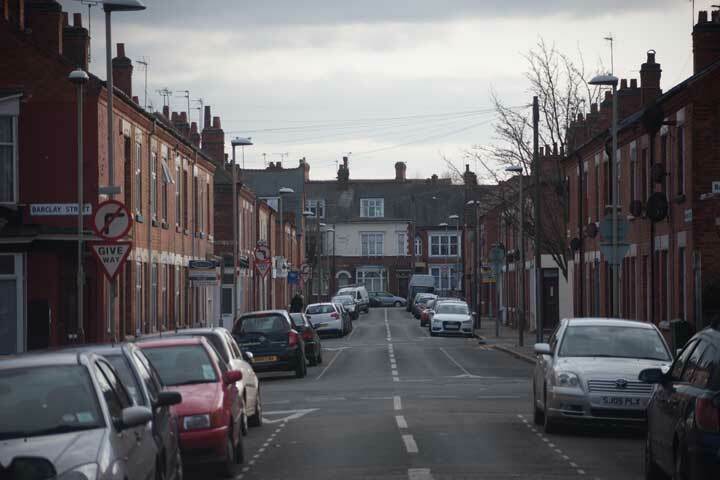 I’ve included some comparison samples below from different parts of the image – here they are at about 90% zoom. First, from the far left side. The stonework on the main door is much more clearly delineated. The top of the towers is where I’d normally be looking for softness. 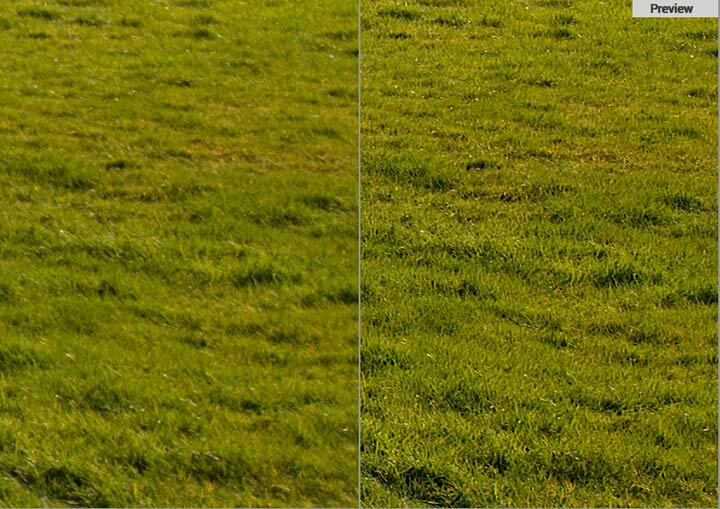 The grass is at the limit of resolution for the sensor. Looking at the performance with my Canon TS-E lenses, I thought back to when I produced a review of the Samyang 24mm T/S lens a while ago. This lens, whilst benefitting from sharpening, will need attention to its geometric distortions too if you’re using it for something like architectural work. This is a 100% view at full shift – see the review for more about addressing distortions in shift lenses. 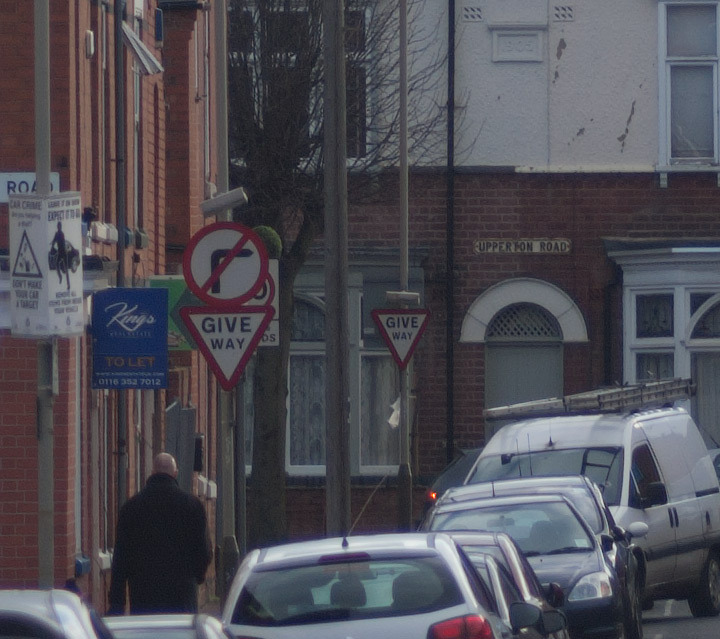 I’d note that turning up the correction to ‘Strong (CA)’ produced too many artefacts in this example. During testing I often found that sharpening was often a bit over what I’d like in some parts of the image (but do remember how highly zoomed-in many of the examples are). 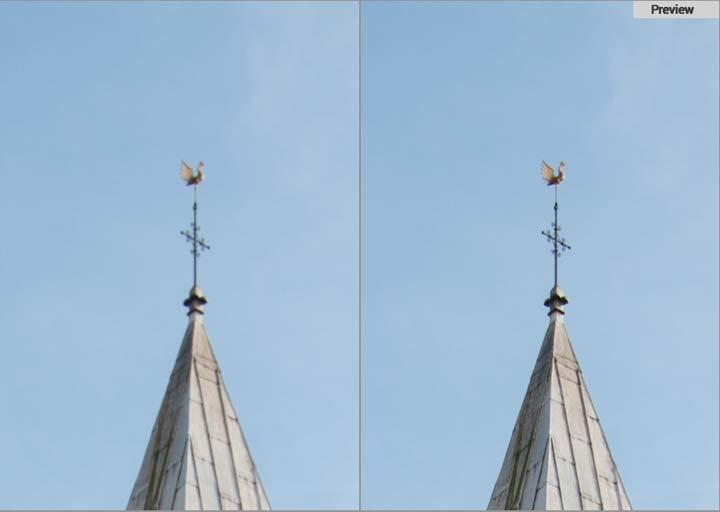 Fortunately by sharpening a duplicate image layer, I was able to reduce the opacity of the sharpened layer quite easily, depending on the lens and image. A more flexible approach would be to mask the duplicated layer to reduce the sharpening in some parts of the image. The sharpening I’m seeing here is bringing out out sensor (and RAW conversion) features that would easily be lost in normal use. 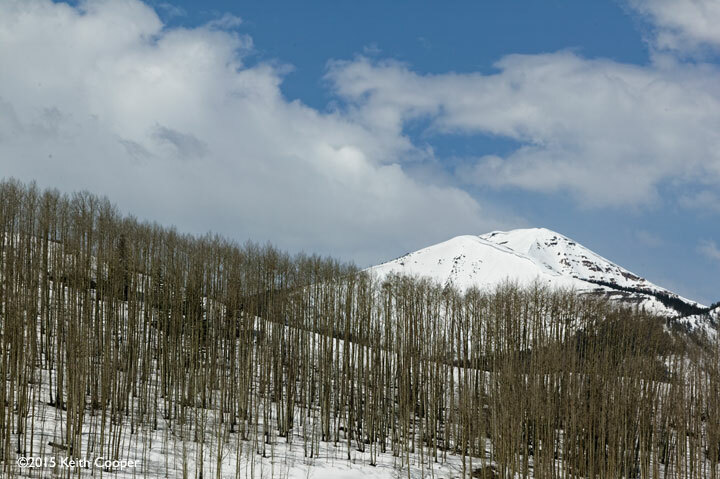 Fine detail, such as in these aspen trees, taken with my old Canon 1Ds (11MP) goes beyond what the sensor can resolve. 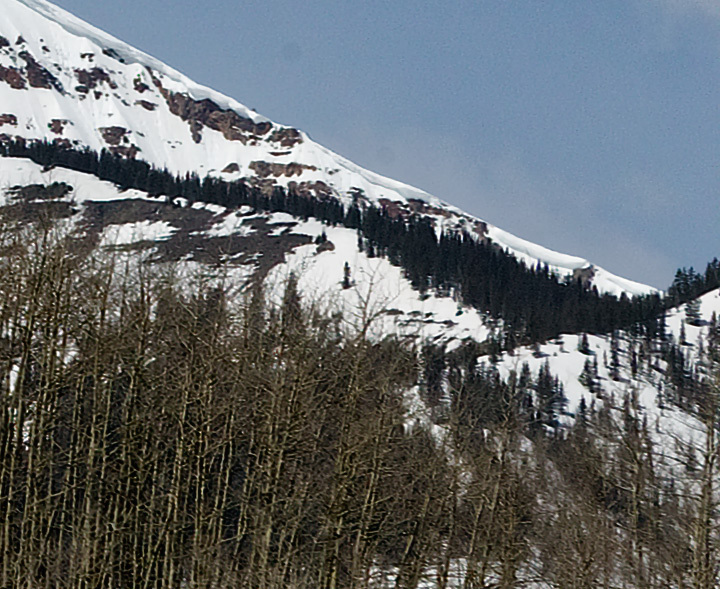 In this 100% crop I’ve reduced the opacity of my sharpened layer a bit, so as to lose some of the detail in the trees. At this scale you can easily see artefacts from the demosaicing process that is part of any RAW converter, so I’ve dampened them down a bit through the modest opacity adjustment. 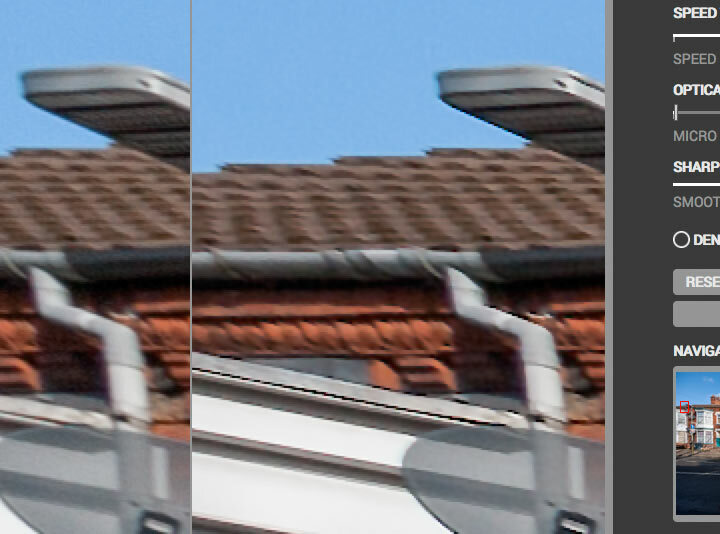 The differences between RAW software packages (and even sensor design) also become more noticeable when sharpened. 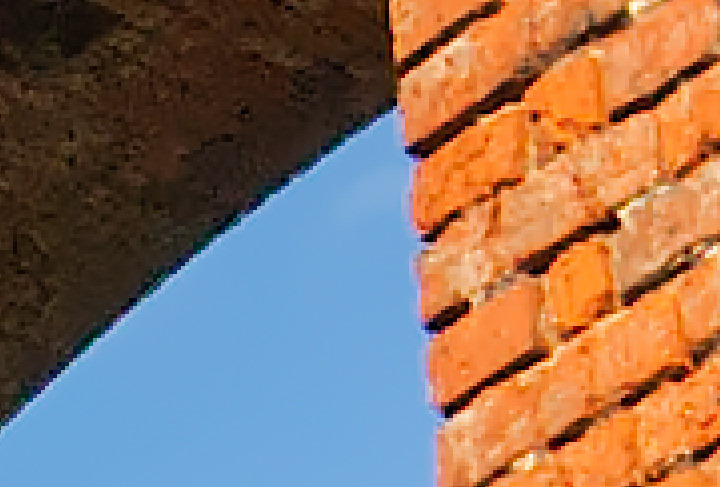 OK, that’s enough delving into sharpening fine detail… get the demo and experiment! How does Piccure handle camera shake. I’m not going into this aspect of the software in such detail, but we all get shots with a bit of shake in them sometimes. 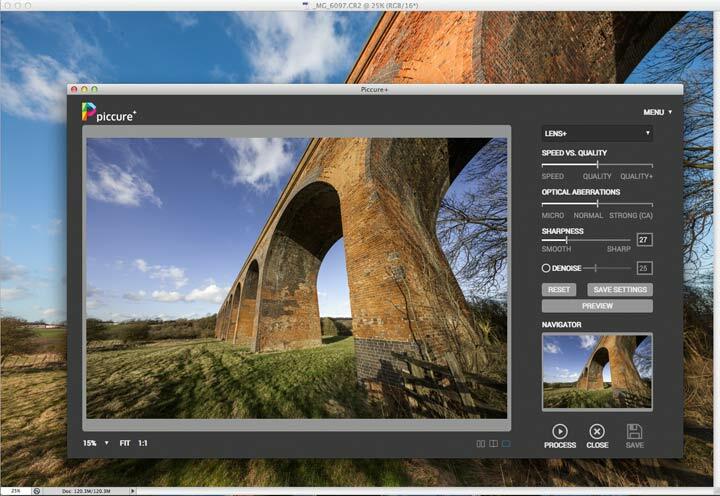 The motion+ setting allows you to select parts of the image for the software to base its corrections on. Do read the manual, since it’s choice of such areas that can make or break the ‘fix’. It worked extremely well on shakes of a few pixels. More than that and it has to be an important image to make the effort worth while. 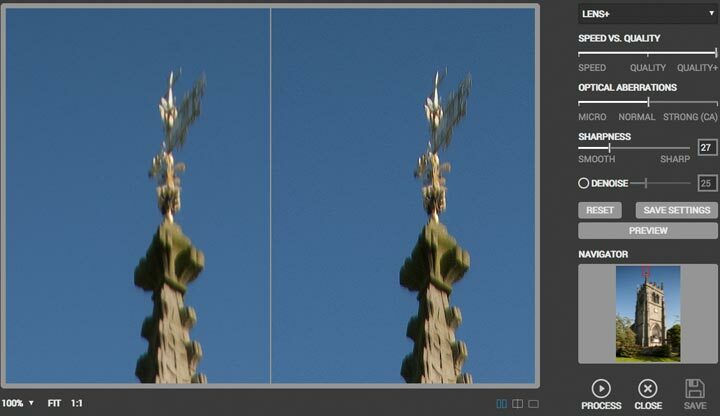 As with the Lens+ setting, be very careful about any sharpening applied during RAW conversion, since it can greatly hinder optimal shake correction. The quality of fine detail sharpening is amongst the best I’ve seen. 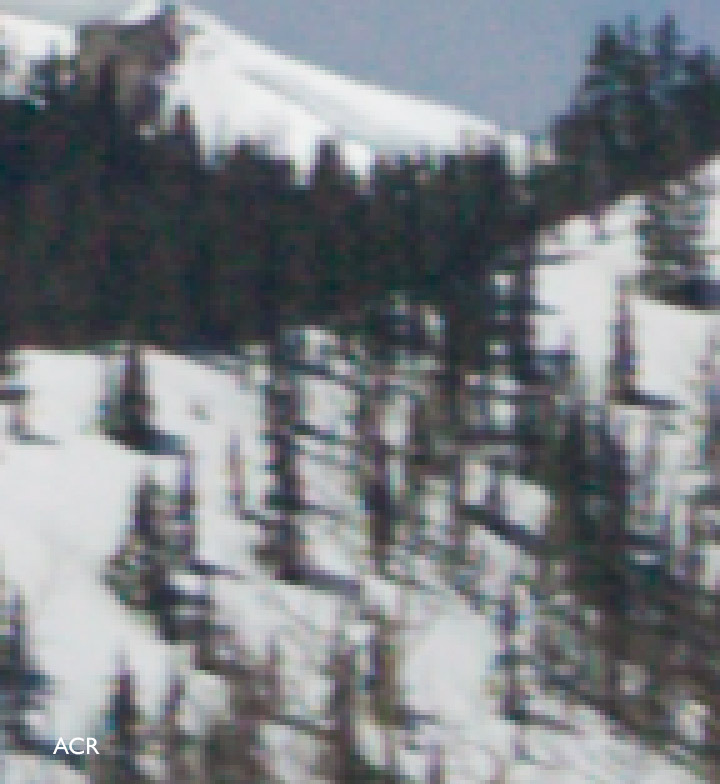 In many examples, it just looks as if I’m now seeing the limits of sensor resolution much more clearly. This makes me wonder just what it will manage once I get the new 50MP Canon 5Ds. However this comes at a price, with one of my 21MP files from my 1Ds3 easily taking six minutes to process on a dual quad core Mac Pro, at the the best quality settings. The sharpening has a real effect when printing, and I’ve already found that I need to turn down my normal print sharpening a bit. It’s another reminder that sharpening is a whole workflow consideration, not just a ‘sharpen for print’ check box somewhere the end. 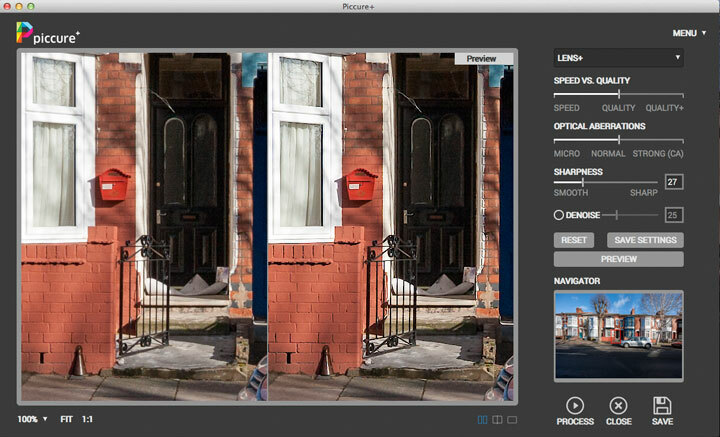 I’ve not made any very large prints yet, since starting out looking at Piccure+ but it’s potentially a very useful tool in some parts of my architectural photography work. Particularly welcome is the ability to work on shifted images. Both my brand new EF11-24 and TS-E17mm have just had a sharpness make-over. There is going to be a trade-off between sharpening and noise, and what ‘looks’ best for any image. For fine tuning the amount of sharpening I found it best to use the ‘Normal’ setting and reduce it afterwards, rather than the lower ‘Micro’ setting. 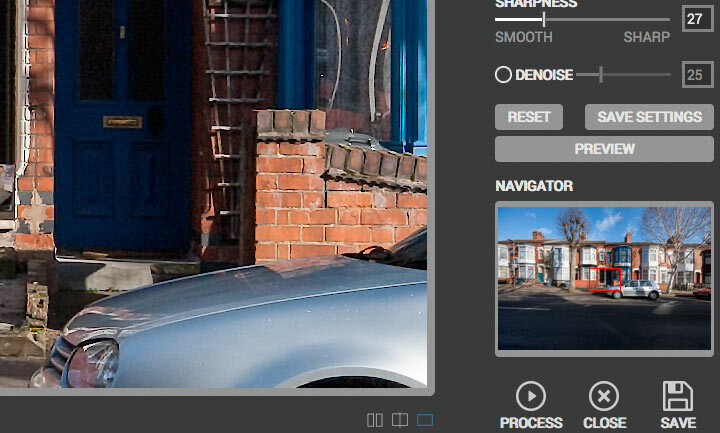 There is also the sharpness slider to try – examples here are all at default settings. If you’re experimenting, then find a few good images and take time to see how the different settings work, and how they differ. It’s not just ‘expensive glass’ that’s helped. I recently paid £2.50 for a 1958 Tamron ‘Twin-Tele’ 135mm f/4.5 lens from a charity shop (about one thousandth of what the EF11-24 costs). It’s M42 fit, so works with my 1Ds3 with a basic M42->EF adapter (via eBay). I’ll post some notes about it in a while (part of my ‘using old lenses‘ series) but it’s a nicely built lens. Coming from before lens coatings were very advanced, it’s a bit low contrast, but look at the improvement at f/4.5 (move mouse over to see the difference). Here’s the full frame. The chromatic aberration tool in Photoshop worked well with this lens, and Piccure sharpened it nicely. I’ve not added any additional contrast enhancement to the 100% crop above, so it’s really only showing the sharpening of fine detail. Whoops – it seems that Piccure+ has problems with displaying images that are not in your monitor colour space (i.e. all of mine). This doesn’t affect processing at all but does mean that if you use a large colour space such as ProPhoto for an image, it will look odd when opened up. They tell me that it is most definitely on the ‘to be fixed’ list – the software does still work perfectly fine with such images, and the colours are OK again when back in Photoshop. Piccure+ is always going to take a while to run, and when I get my 50MP 5Ds, it’s likely to take some 10-15 minutes on my current (2012) Mac Pro. Sure, I could use the faster setting to reduce processing times, but this is a software package that, when I decide I need it, I’m going to want the best it can deliver. This puts it into the category of software I’ll use for individual images and especially some of my large architectural prints. A more refined interface design – this one feels a bit clunky. A bit like a simple phone app – but this software seems made for far more serious use. Ability to return results as a new layer in Photoshop. A global ‘Opacity’ setting for the filter – the ability to blend the original and processed versions. A sort of final ‘strength’ adjustment before leaving the plugin. Fixing of display colour management. Rather slow for regular use, but very powerful.